Now, when I’m all grown up, I think about the things we do online and, ironically, it’s a similar situation. We send emails, buy stuff, or book tickets and take these very seriously. But we also have fun wasting time on Instagram or watching videos of a hydraulic press crushing gummy bears on Youtube because… 🤔 Anyway. Still, why are these activities different? What makes some of them fun and some not? And how can we make them even more fun? So, if we think about the role of design, it means most of the times we intentionally build products that are not meant to be fun to use, we’re not designing towards a serious experience for users, we’re actually designing towards a boring one. And true, it might be a usable and efficient experience, but that doesn’t make it less boring. Fortunately, we do have something that can help with this and that’s the concept of gamification. At some point, we realized that games are the most fun things we have, so it made sense to borrow from them. And this is what gamification actually is. Gamification = The process of adding elements from games to non-game products or services. Authors that wrote extensively about gamification, like Karl Kapp, Kai Erenli, or Darina Dicheva, mention several components when creating a gamification system. I find that 5 of them are absolutely essential for the system to be successful, two others are nice to have. Goals — Set goals for users as they give a sense of purpose to the system. They make us feel pleased when we succeed and empower us with a feeling of accomplishment when we achieve them — an essential component of fun. Rules — Agree on the rules of the “game”. Limitations actually help us become more creative and allow us to appreciate the fun. Rules are repetitive and continuous actions users need to do and they are tightly integrated with the main offering of the product. The best type of rules are simple to understand and to execute and require minimal or no input from users. Every small thing you ask of them will be followed by a conversion, so keep it simple. Feedback — Give feedback to users, specifically progress feedback. Users need to see how well they are doing in the context of the goals you set for them and the rules that they’ve agreed upon. It comes in different visual forms like progress bars, levels, encouragement messages, animations etc. Rewards — Offer rewards to users. These are things we give them for the time and effort they put in and can be anything from virtual badges, points, trophies, coins, leaderboards, stickers, avatars, to actual material gains like money. A common rewards setup includes a points system that quantifies the performance or the users, badges that are awarded for special achievements, and leaderboards that rank users based on the previous two. This mix is commonly referred to as “BPL” (Badges, Points and Leaderboards) and is often wrongly understood as the definition of gamification itself. Motivation — Offer motivation for users to act. There are 2 types: intrinsic motivation, that comes from within us like curiosity, pride or a sense of achievement and extrinsic motivation, that comes from outside us like money, grades or praises. Research showed that intrinsic motivation is a lot more powerful than extrinsic motivation. And Fiero, the feeling of rush right after we win something, is considered to be the ultimate intrinsic motivator. Freedom of choice — A system will be fun only when users choose to voluntarily participate in it, and follow the goals and rules. Not when they’re forced or tricked into it. Freedom to fail — Failing without consequences keeps users more engaged than when they’re getting punished because they can try again. Denying them that, hinders their involvement. How does this look in real life? Below, there are three examples of successfully implemented gamification systems from companies that make use of them extensively: Fitbit, Waze, and Duolingo. Goal — Reach 10.000 steps each day. Every time users reach their goal, Fitbit smartwatches and trackers become more relevant, increasing usage and adoption, so goal completion rate is directly linked to the core product. Rule — Walk. The fact that walking is a basic activity and trackers record steps automatically, means that there is no need for specific input from users to agree on it, so there is no conversion when it comes to participation. Feedback — It comes in the form of a progress circle and a steps counter, letting people know how much more they have until they reach their goal. Rewards — Fitbit offers badges and trophies for special achievements and uses steps as currency to build leaderboards and rank users. Motivation — Apart from rewards, the intrinsic motivation for users is that they become physically healthier, which is quite a nice end goal. Goal — You get to become a member of the Waze community, giving and receiving help from other wazers. The more members, the bigger the increase in user-generated content and ultimately the more advertisers they will attract on the platform. Rule — Waze asks its users to report incidents. To do that, they have to choose between 11 types of reports (plus sub-reports), send it on the spot and do it while driving, which is quite a lot. Due to the complexity of the rule, most likely the percentage of participants is not overwhelming either. Progress — Users get likes and comments for their reports, that later translate into points which help users increase their level. It’s a very nice interactive way for them to get feedback for their actions. 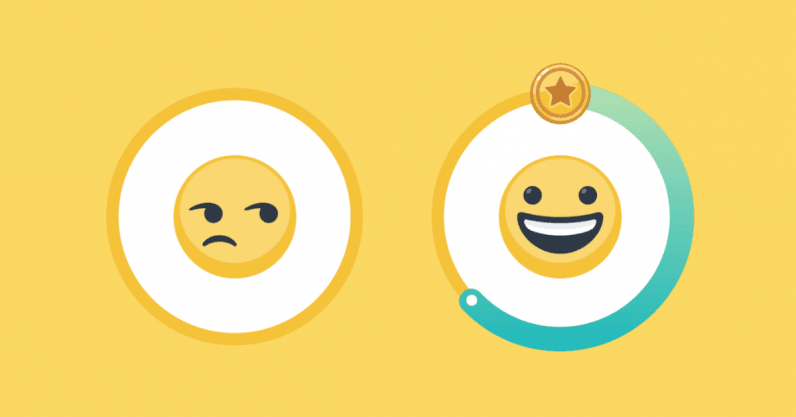 Rewards — Waze rewards users with points that allow them to advance through 5 levels. It also offers achievements and shows them their overall rank on the platform. Motivation — It’s the nice feeling you get after helping other people. As part of a group, users also feel accepted, important and useful — a powerful motivator to become a contributor. Goal — Learn a new language. It’s powerful, because it can help people from a professional and personal standpoint, but also very challenging. And Duolingo knows that and tries to attract those interested by making learning fun and interactive. Rule — Take lessons and practice, that’s pretty much it. It’s simple and there are no time constrains. It’s an active rule and probably the biggest challenge is keeping users engaged in doing it for a longer period of time. Progress — Users see how well they’re doing by following a few visual elements like progress bars and progress circles, weekly breakdowns or chapter levels. Rewards — Duolingo highlights streaks and gives badges for special achievements but also offers a few smaller rewards like crowns, encouragement messages or progress quizzes. Every action inside the platform is seen as an opportunity to add interactivity to the system. Motivation — Due to the specific purpose of the product, learning a new language helps users improve their careers, make new friends and discover new cultures, all of them intrinsically precious motivations. Makes experiences fun — People remember feelings, whether good or bad, felt at the peak and end of their experience. Reason why, in psychology, it’s called the peak-end rule. So, every time we build products that are not meant to trigger positive emotions, we’re offering either a boring and unmemorable experience or a negative one. Long term, both are equally bad. Because gamification systems act as a bridge between user sessions and usually require users to return in order to complete a goal or claim a reward. People also have a tendency to remember incomplete processes better than complete ones according to the Zeigarnik effect. So, having something ongoing to come back to gives users an extra reason to return. Gamification is usually associated with “BPL” (Badges, Points and Leaderboards). And sure, rewards are important but they’re just a cog that’s part of a machine. Successful gamification systems also include setting goals and rules, giving users feedback and having intrinsic motivation for them to participate. Stating that gamification doesn’t work without having all of its components in place is like holding a propeller in your hand and moaning that it doesn’t make you fly. On a priority scale, products first need to be functional and usable. If users can’t complete the tasks you want them to complete due to poor implementation or poor interaction design, expect pitchforks and clamor instead of confetti. Gamification will not fix product, technical or usability issues. Gamification works when it is tied to the core offering of the product. The best gamification systems ever made were built as an integral part of the product, right from the start. The good part is that, as long as the nature of the product offering allows for such a system, they can be added at a later stage and be just as effective. We play, when it’s fun. We work, when it’s not.